Activities, strategies, lessons, and planning pertaining to my eighth grade Reading/Language Arts classes. My Grading Process - Standards-Based Grading can be crazy, but it's something been completely thrown into and have to accept 🙂 It's not so bad on the teacher end once you get started with it. It's just very individualized. And can be quite a lot of work. A House, A Home - After reading "House on Mango Street," the first section in the book, this is a great way to help students visualize the Mango Street house and compare/contrast it to their own. Perseverance Unit Reflection - A powerful skill for students to be able to master, especially by eighth grade, is the ability to reflect and synthesize information. As students finished out their units on perseverance (Hunger Games for my section) my co-teachers and I wanted to create a final reflection to see how they connected their novels, people they researched, and collaborative discussions. CRAP Test - My eighth graders are working on a perseverance project to tie into Hunger Games. To connect main character Katniss' life with other lives, the students are researching a person in their field of interest and finding evidence as to how that individual persevered through difficult times and challenges. To do this, they need to use the internet---thus the CRAP Test--finding reliable sources. Assessing Character Symbols - Okay, Marisa. You can do this. I coach myself as I begin my first Standards-Based Grading. Just be honest. Be consistent. And be smart. Integrating Hunger Games Movie Clips - My eighth graders finished the Hunger Games today. Boy, did I forget how heart-wrenching the ending of the first book was! In addition to the Character Symbol activity I had them working on, I also wanted to integrate the movie in some way, so I used YouTube clips and a discussion post on Google Classroom to enhance and deepen student understanding of the end of the book. Character Symbols - Today I am completely taking over the 8th grade classes! They are almost finished reading the Hunger Games and since the standard that we are assessing is the ability to cite textual evidence and make an inference, I created a Character Symbols worksheet to help them work on inferences in a different (and hopefully fun) way! 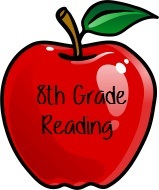 Hunger Games – Scaffolded Notes - I stepped into this placement at Forest City Middle School while my eighth grade students were in the middle/end of reading Hunger Games. This was a difficult spot to enter, but I squeezed myself into the lessons by reading aloud to the students and helping with scaffolded notes. Writing to our younger selves, connecting to the theme of growing up in House on Mango Street. Exploring the theme of ‘growing up’ and connecting to their personal lives. Another great student example–going beyond the obvious. Listing ways we have grown up to relate to Esperanza as she matures in House on Mango Street. Comparing and contrasting female characters in House on Mango Street. Reflecting and synthesizing as we end the Hunger Games unit. Summative assessment where students took on the voice of a reporter! Practicing figurative language in talking about our family members. Some students went above and beyond with their creativity and color! I loved this girl’s. She even added a border! Listing our roles in our families, communities, at school, in sports, etc. I hung up the crests to show student work! I Am, a summative assessment of figurative language. Classroom calendar and daily learning targets. Vignette Notes to help my students learn pre House on Mango Street. My color-coding for the I Am Assessment to make it easy to label and identify figurative language. Post-reading questions and communication on Google Classroom. Writing letters to our sixth grade selves giving advice. Students were the teachers today. Here are their notes and questions. The My Name/My Family Crest activity. I had the students write a paragraph on the back explaining their symbols, why they drew them, and what they learned about their family as a reflection and writing assessment. Taking on the voice of a reporter.